Mutations explores some of the lesser-known variations of familiar characters from movies. In the late 1970s, television seemed as natural a home for superhero adventures as the big screen, if not more so. Richard Donner’s 1978 Superman was a game-changer that proved a story about a man who dons tights to fight crime could have the grandeur and sweep of an old-fashioned epic, and that a superhero movie could be important as well as entertaining. It was, in many ways, the big bang that produced our current superhero era. Before that, however, the really successful, influential superhero stories were on television. Batman, The Incredible Hulk, and Wonder Woman were all small-screen smashes before they were brought to the big screen. (Wonder Woman still hasn’t made it to the big screen yet, though she’ll debut in Batman v Superman: Dawn Of Justice next year.) Even Superman was a hit on TV before the movies. 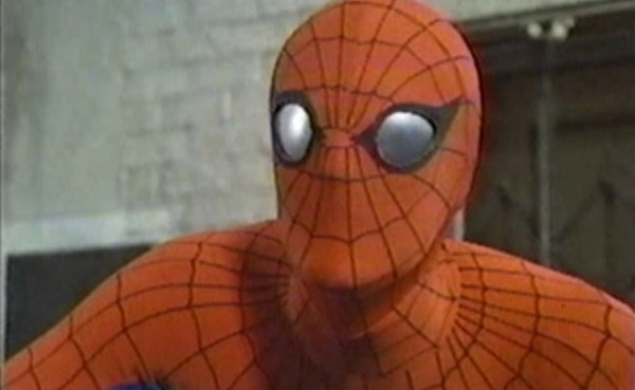 And though it lasts two hours and has what can charitably be deemed a feature-length plot, the television movie Spider-Man Strikes Back, edited together from the second and third episodes of the 1978 Spider-Man TV series, unmistakably falls closer to the “television” than “movie” part of the TV/movie divide. The film stars The Sound Of Music’s big-haired Nicholas Hammond as Peter Parker, the world’s oldest college student (though to be fair, Hammond was merely pushing 30 when the movie aired), a shutterbug with the suspicious good fortune of always being around with a camera while his good friend Spider-Man is strutting his stuff. The plot finds one of Parker’s professors illustrating some manner of scientific principle using some plutonium he has lying around. This concerns Parker, and by extension his good friend Spider-Man, who worries that having the components for creating a nuclear bomb around might lead some unscrupulous soul to steal the plutonium and make an atom bomb out of it. This stray plutonium also attracts the attention of some snot-nosed kids who decide to steal the plutonium just to make a point about how people shouldn’t leave plutonium lying around, or kids like them (despite also appearing to be well into their mid-30s) will use it to build atom bombs. As is often the case, Spider-Man is wrongly suspected of the plutonium theft. It seems that because he’s always lurking about crime scenes in his capacity as a crimefighter, he is often misidentified as a criminal, and he’s understandably reluctant to have his good friend Peter Parker provide him with a good alibi. The tagline for Superman famously promised, “You will believe a man can fly.” Spider-Man Strikes Back would have to settle for, “You will believe a poky man in what appears to be flannel pajamas can walk slowly and cautiously.” Spider-Man Strikes Back seems intent on showcasing its hero in Spider-Man form as stingily as possible. Spider-Man doesn’t throw his first punch until the film is half over. He is rarely in costume, and when he is, he is generally doing things like walking carefully on ledges and crouching while standing on rooftops, which is the cheapest and least involved way the film can technically have Spider-Man onscreen without having to even attempt special effects. As Peter Parker, Hammond looks like a middle-aged model for cologne and cigarettes. He’s devoid of angst, neuroses, and personality, notable only for who he pretends to hang out with. If he weren’t secretly Spider-Man, he would be every bit as boring as good old Mr. White.